Woohoo! Its Saturday! This Saturday was a special day because I was without kids for 6 hours. I needed a break. This past week was a doozy. (Do you use Google search for spell checking like I do?) I mentioned in my last post about all the baking, well there was also lots of cooking, and Dr. appointments, and preschool runs, and preparing for a special little man’s 3rd birthday. It was busy. So I made it out alive and decided to shop – all day. Well, most of the day. When I arrived home it was already 4:30 and the kids were getting cranky and whinny, so I needed something fast for dinner. Grilled Pizza. I know I’ve posted this recipe before, but I’m posting it again because you really need to give it a try. And the last time I posted it I didn’t do a very good job of explaining. 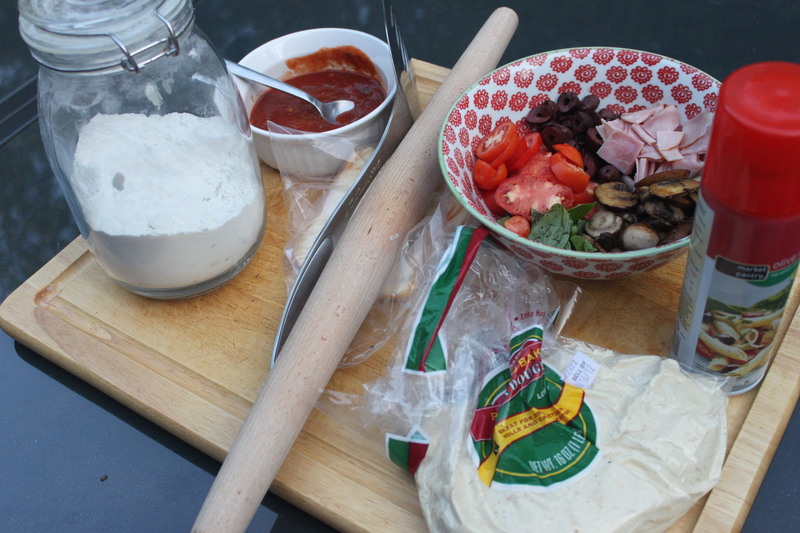 This is everything you need – flour, dough, toppings, sauce, rolling pin, and grill. Heat the grill to medium high and make sure its well oiled. Divide and roll out dough. I can usually feed about 3 adults with one dough round. 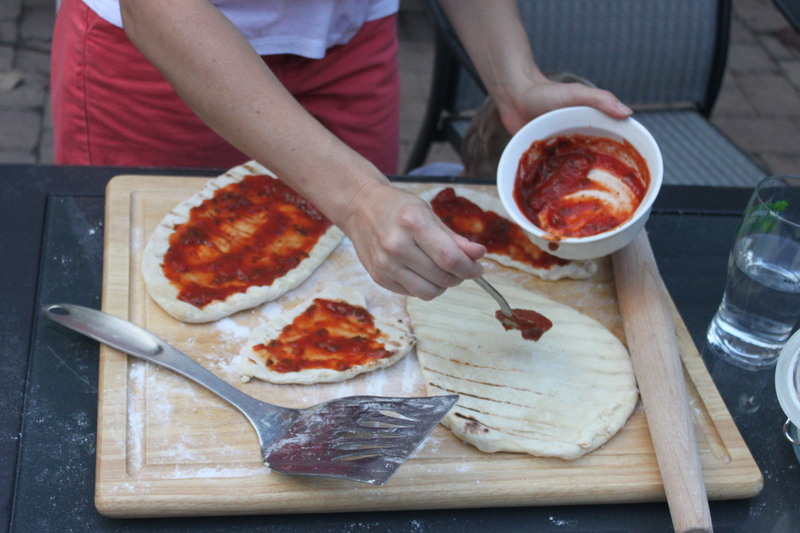 Place the dough on the grill (sorry no pictures of this) for about 2 minutes. 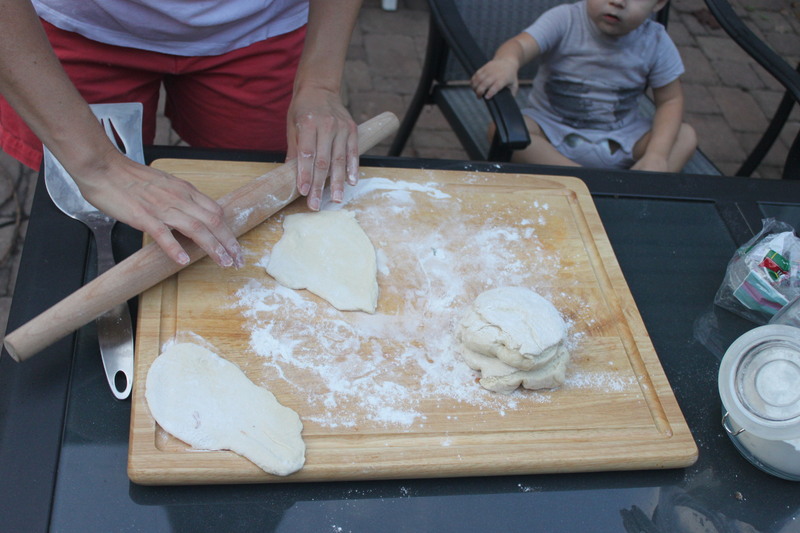 Then flip the dough on your cutting board grilled side up so the other side can be cooked as well. Add sauce. Try pesto – its amazing. Add whatever you want as your toppings. 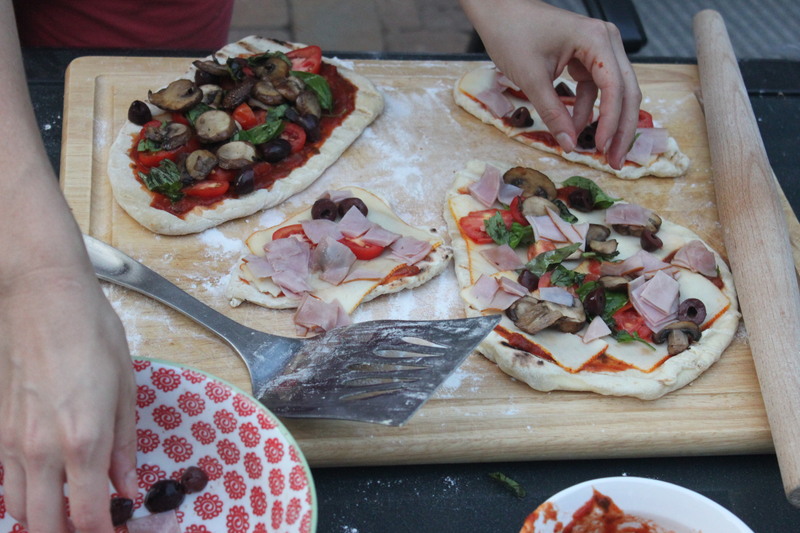 We did cheese, ham, olives, basil, tomatoes, and mushrooms. Now its ready for the grill. Place the pizzas back on the grill and close the lid. Leave them alone for about 4 to 6 minutes. Your cheese should be melted and the toppings heated. 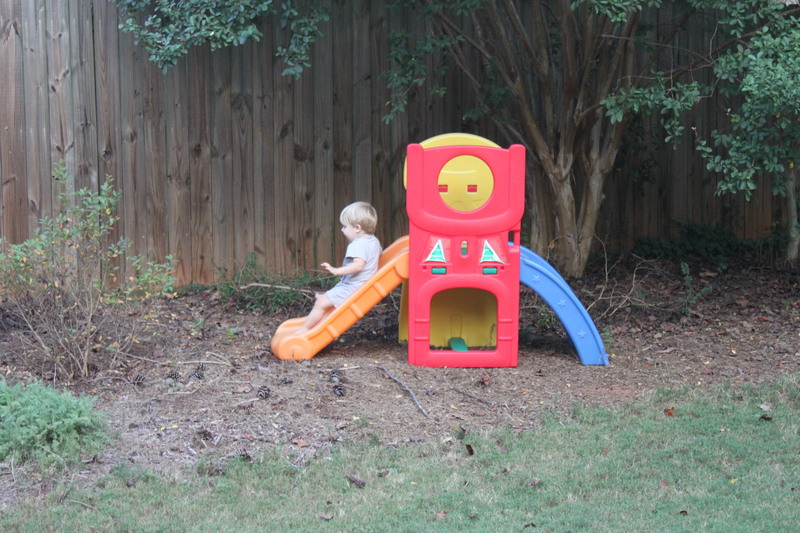 While you’re waiting, take a ride on the slide. 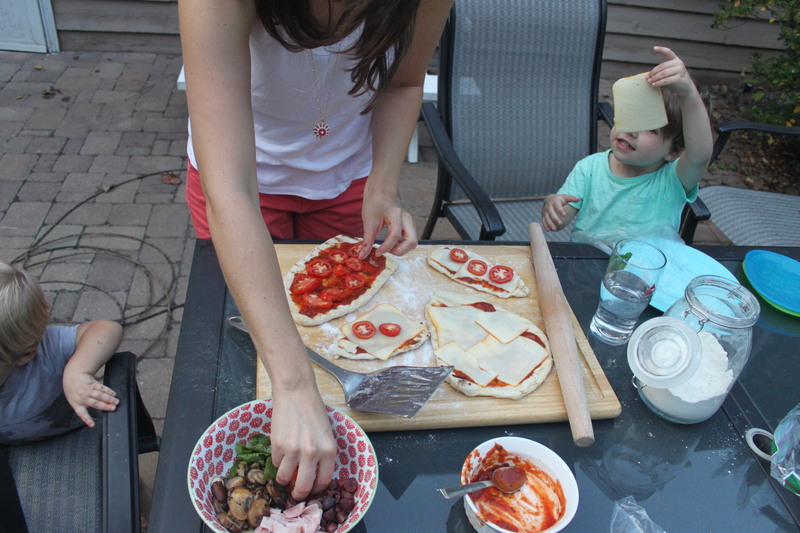 Take the pizzas off the grill and dig in! – Oil grill and heat to medium. Roll out dough into desired shape and thickness. Place dough on grill for 2 minutes (until grill marks appear). Take dough off grill and place on board or working surface grilled side up. Add sauce and toppings. Place back on grill for another 4 to 6 minutes, until cheese is bubbly and toppings heated. Note on the bread recipe from last post: this is the site I found the recipe http://simplysogood.blogspot.com/2010/03/crusty-bread.html. I had several of you want to know more about this recipe. Please let me know if you tried it and if you tried any variations. Let me know how the bread turns out. 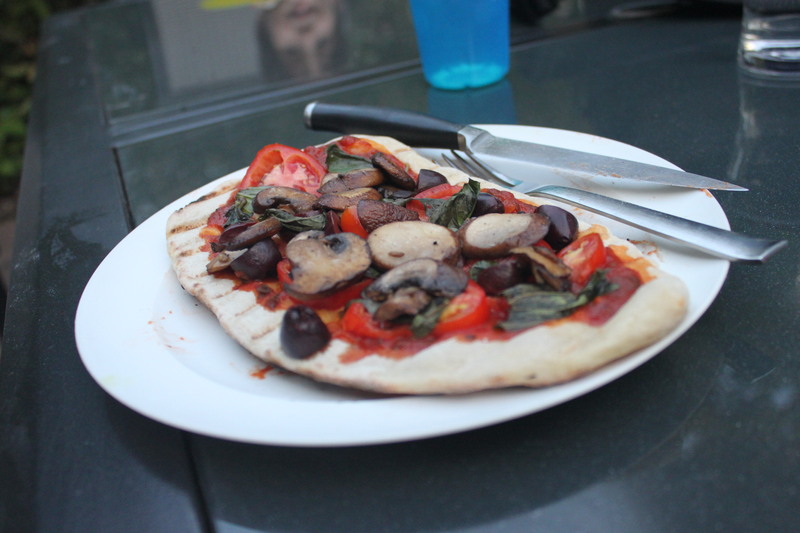 The pizza on the grill is delish! 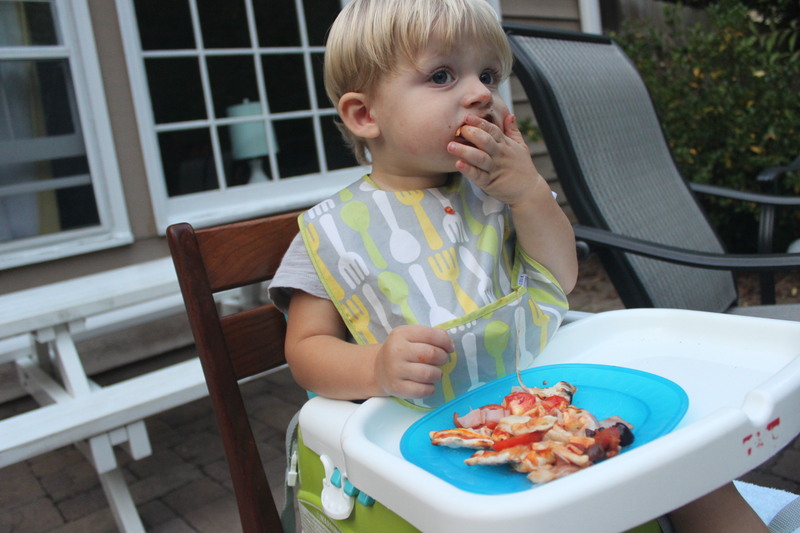 First time we had it was at your place…..really tasted good! Could have been because of the company as well…..but still…..it was good! The Trader Joe’s pizza dough was really tasty. I think it had something to do with the company, too. I am definitely trying this, thanks! After you try it, let me know how it turns out. I love to hear about other people’s creations.